A balding man once told me, “I would ride to work, but I don’t want to get helmet hair.” Though I struggled to keep a straight face, I understood his concern. Many people feel they can’t ride to work because they wouldn’t be able to maintain a professional appearance. We often associate cycling with athleticism and spandex, where each ride is a sweaty, breathless race. It’s no wonder, when popular media has relegated bicycles to the polar opposite realms of either the Tour De France athlete or the pocket protector geek. The image of cycling as an extreme sport can generate all sorts of reasons not bike to work. But these reasons are easily overcome. Looking good on and off your bike is easier than you might think, and with minimal effort, you can transition from saddle to swivel chair, and your smile will be the only giveaway that you rode to the office. Avoid the greasy gears and chain by rolling up your pant leg. Reason #1: I don’t have the right clothes! Riding a bike to work does not actually require special aerodynamic clothes. When picking out what to wear for your commute, you need look no farther than your own closet. Be sure to roll up your pant leg, tuck it into a boot or use a pants strap to avoid getting caught in your gears. When riding in a loose skirt, tie the loose ends in a knot to keep them out of your spokes, or use one hand to keep things in place. Reason #2: But I’ll get sweaty! Ride slower. If you start to overheat, take the time to stop and remove a layer. If you cannot avoid mild exertion during your ride, choose a base layer that is breathable and will dry quickly once you get to work. I am a diehard fan of the naturally wicking and anti-microbial properties of merino wool. Also, getting your gear off your back and into a rack-mounted pannier can significantly reduce the sweat- factor. Reason #3: I’ll get grease on my Guccis! Reason #4: There are no showers at my office. Let’s say on your way to work you got splashed by a monster truck, and now you need to take a shower before you can look presentable. If your workplace doesn’t have showers on site, try a nearby gym. 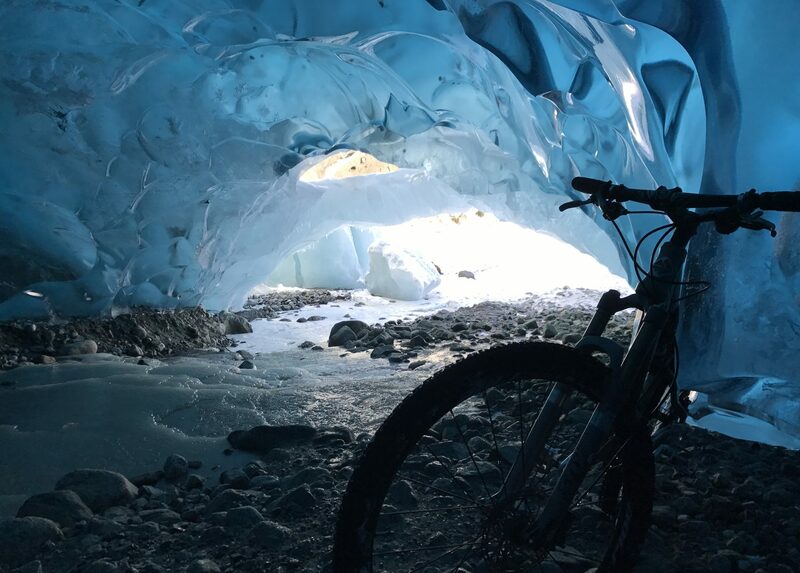 Through the month of May, Pavitt Health and Fitness and The Alaska Club are both offering free locker room access to cyclists who show their helmets at the front desk. If this is not an option, a washrag and quick splash of water in the restroom sink can go a long way. Reason #5: What about my hair? According to New York fashion mag Allure, your hair can look even better after a stint under a bike helmet. But for those of us who don’t use products or pins, simply riding slower to avoid sweating will eliminate the hair-plastered-to-forehead look. Reason #6: OK, maybe helmet hair isn’t such a big deal. But I look bad in a helmet. Helmets have come a long way from the thick styrofoam cooler caps of yesteryear. Nor do you have to wear a helmet that makes you look like you’re racing to the office. Now there are all kinds of stylish, colorful helmet designs by companies such as Nutcase, Lazer and Bern. If you want to switch up your style frequently, some companies have started producing chic helmet covers to look like everything from riding caps to garden hats. In all seriousness, I cannot figure out the roll-clothes-up-in-a-towel-and-they-won’t-wrinkle thing for the life of me. Apparently I have insufficient towel skills. Man, you really need to work on your towel skills. In Juneau, where rubber boots are considered a necessity by most and fashion by many, it’s easier to look good on or just-off a bike than it is in many locations – compare our relatively balmy temperatures to the heat of southern California or (shudder) Utah (where I biked everywhere for years during college, even in 100+ F weather), and the risk of sweat on a mellow ride is negligible, and the weather easy to dress for. But even in places where fashion is EVERYTHING, Cycle Chic proves that you can look downright fabulous on a bike: http://www.downtownfrombehind.com/ is one of my personal favorite bike/fashion blogs, but search for “cycle chic” and prepare to be amazed by the world-wide appeal of this “movement”.